Well we shall see if CNS wants him now like before, since all the flaws have come out. RTR! "Crimson Tide hosting important recruits this weekend"
Most Alabama football fans classify T’oto’o as a must get. Not only is he a talented and physically gifted player, his inside linebacker position is one needing more roster depth. 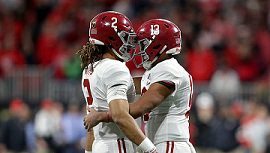 While too early to make a prediction, there are some who believe To’oto’o could make the Tide’s two-deep as a true freshman. The major competition for To’oto’o is Tennessee and Tide fans hope the loss of Tosh Lupoi will not drive the young man to the Vols. Nick Saban and Pete Golding have been working hard to close him. Well if CNS wants him he will get him if not someone else will take his place. I am not worried about this one myself. Does he want to win a NC or just play ball. RTR! Every recruit that has come to Alabama since CNS took over in 2007 and stayed at least 3 years has at least one national championship ring. This has never been accomplished in the history of college football, and there is no end in sight. Even Bear had some rebuilding years. If these kids want a ring, they better get while the getting is good. Sounds like the coaches and CNS has been extremely busy going after good players. RTR! Would be nice to get about 5 of these guys. If we get Keilan Robinson, we'll hear a heavy dose of "Handoff to Robinson..." this year. Brian Robinson has already announced his intention to become a starter and leader. Yeah, he's earned his playing time. Looking forward to watching him shine. It just dawned on me; last year we had 2 Harris' at RB. This year, 2 Robinsons? And 2 Tuas or whatevers! I am looking forward to what the new asst. coaches have brought in for us. RTR! Mrs. Robinson has been busy. Well, she was quite the ho in the late 60's.